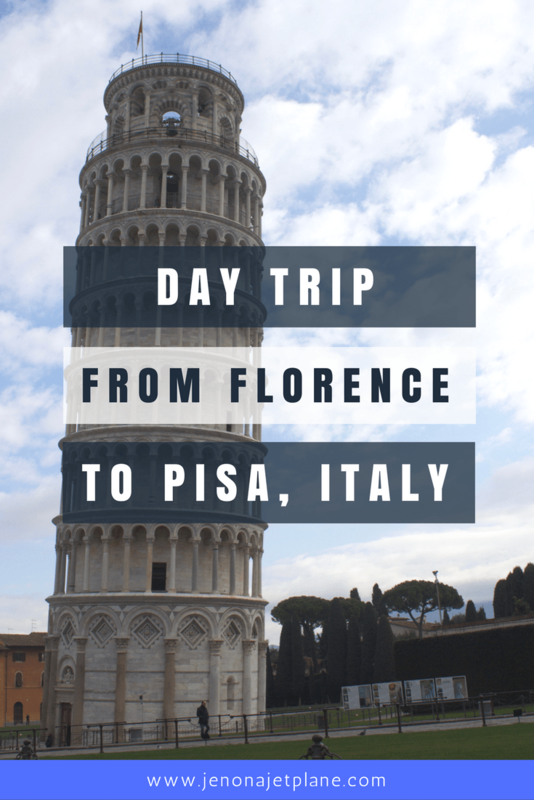 When I learned you could get from Florence to Pisa in about an hour, I knew I had to squeeze it into my 3-day itinerary, no matter how tight. After all, it’s not everyday that you see a piece of architecture that defies gravity. I wanted to get my token tourist picture holding that sucker up. I make it a point to see everything unique and wonderful within driving distance of my destination, so if there’s a UNESCO World Heritage site or World Wonder within reach, I do my best to get there. 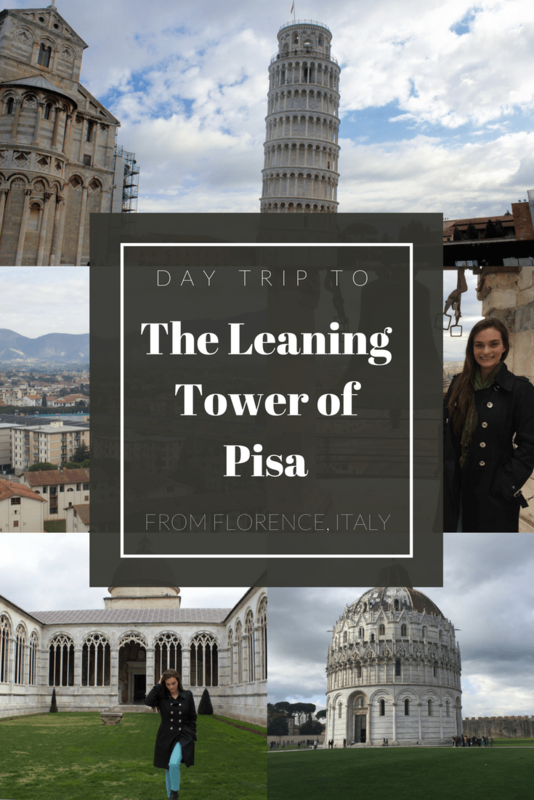 I had planned to set aside a full day and was pleasantly surprised to find I could manage a trip to Pisa and back in just a few hours, making it back to Florence by lunchtime to gorge on some of their delicious food. 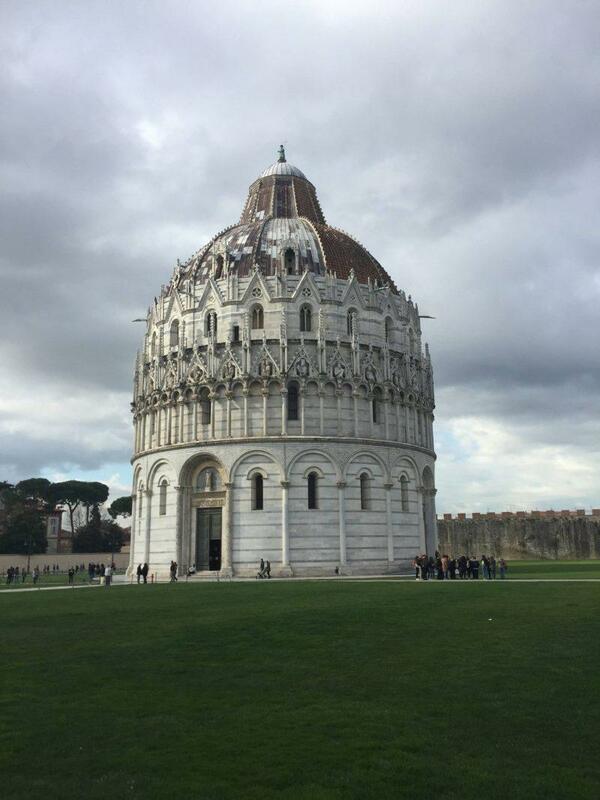 If you’re in Florence and thinking of making a half-day trip out to Pisa, it is absolutely worth your time! The complex consists of more than just the Leaning Tower of Pisa, so you have plenty of photo opportunities, and there’s not much else in the city to attract visitors so this is the perfect way to knock the site off your list. It is easy to get to Pisa from many cities in Italy thanks to Italy’s advanced rail system, but it’s only an hour away from Florence by train and makes the perfect half-day trip while visiting Firenze. 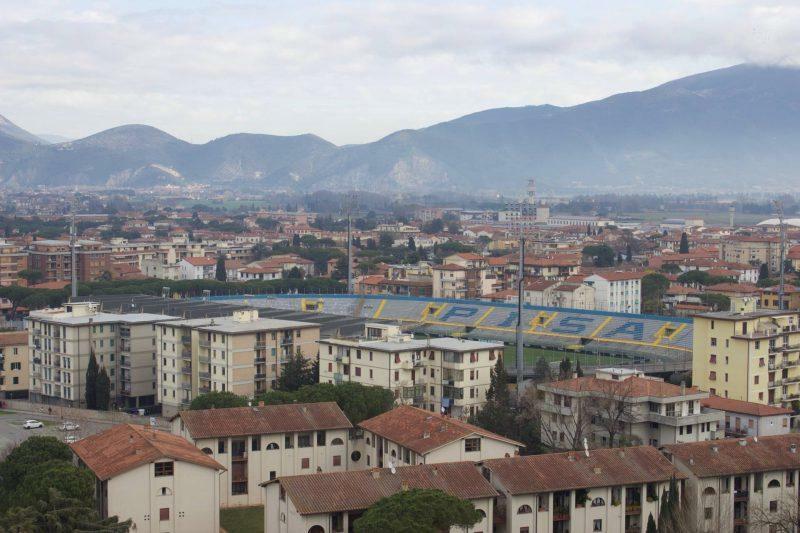 Take the train from the Santa Maria Novella station in Florence to the Pisa Centrale station. The ride is nonstop and tickets start at 8.50€. When you arrive in Pisa, you can hail a taxi at the Centrale station and have them take you directly to the Pisa complex. The drive takes approximately 10 minutes so I wouldn’t necessarily recommend walking on a hot day or if pressed for time. Expect to pay about 10€ each way for the ride. 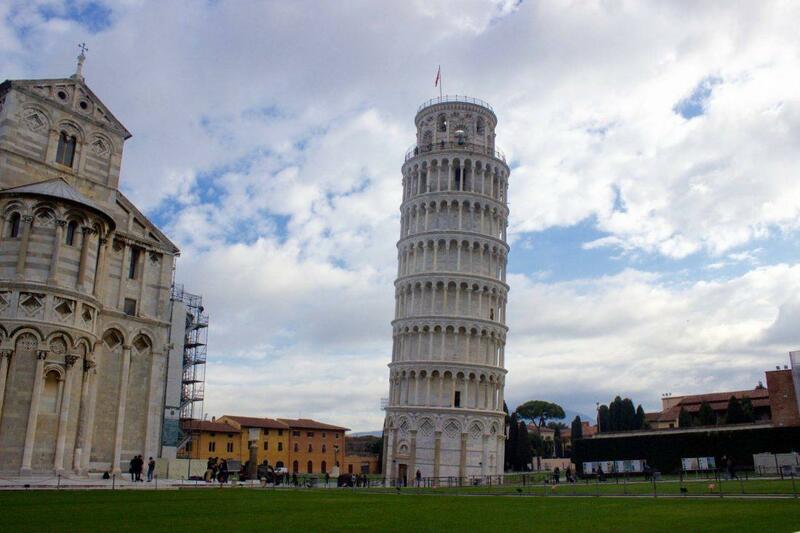 How do you enter and climb the Leaning Tower of Pisa? 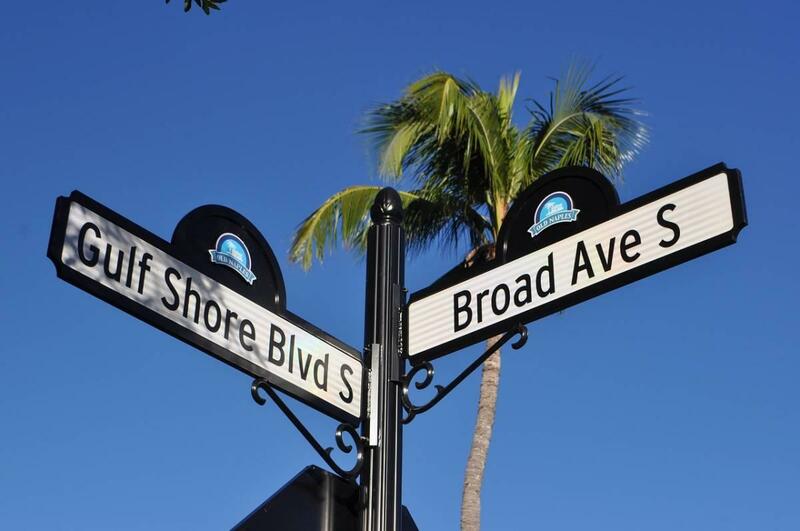 You need to buy a ticket, which you can do online or at the complex when you arrive. It costs 18€ to enter and it helps to book ahead so you can schedule a time to climb and avoid a wait. You cannot bring any bags with you and must check them before entering, but you are allowed to bring your camera. There are 300 marble steps to climb, well worn from visitors over the year and a little slippery so watch your step. There’s one area where you can get out and walk around the perimeter before reaching the summit. At the very top, there are bells and you can walk (with a bit of a vertigo sensation) around the tower for views of the city. The Leaning Tower isn’t the only site at the Pisa Complex.You can add on entrance to one, two or three monuments for an additional fee. This dome-topped building was the second building constructed and is designed to be acoustically perfect. Acoustic resonance demonstrations are sometimes put on for visitors as well as singing performances. The decorations are minimal, but guests can climb to second level and walk around for a 360 degree view of the structure. Officially referred to as The Museo dell’Opera del Duomo, meaning the Museum of Cathedral Works, this venue is a former seminary located adjacent to the tower, next to where you check your bags. It displays art and medieval sculptures from Pisa but, I have to confess, I skipped this attraction as I was a little museumed-out at this point having spent a few days in Florence. 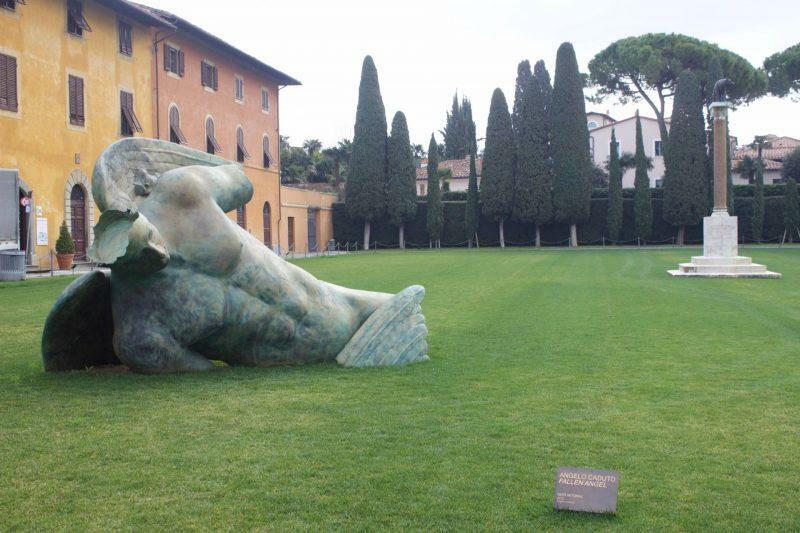 I was captivated, however, by the fallen angel statue on display in the grass out front. It was a jarring image almost reminiscent of the ruins of Pompeii. The facade of the cathedral on the outside is impressive, and in contrast to the Baptistery it’s quite ornate on the inside as well. The cathedral prominently features an elaborately carved pulpit (pictured above) at its center. 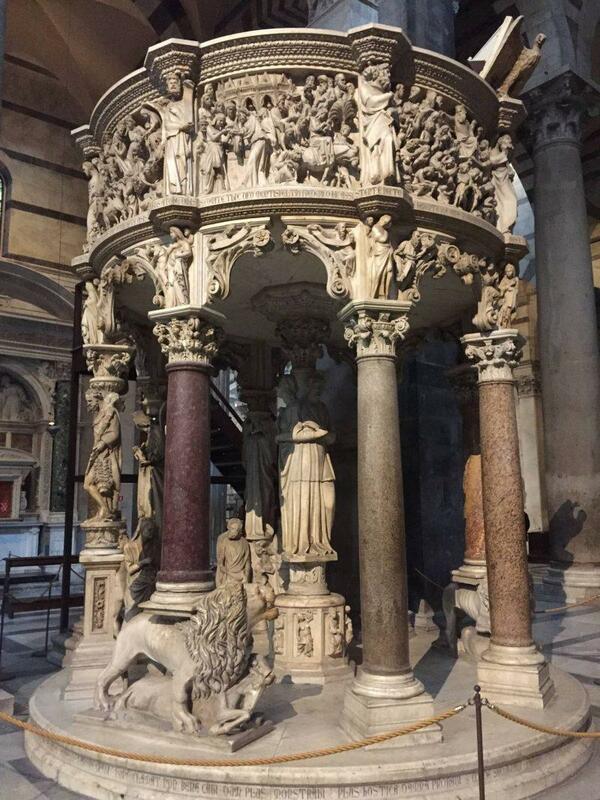 Carved by Giovanni Pisano, the pulpit survived a fire in 1595 and is a considered a gothic masterpiece. This is the only monument that is free to enter in the Pisa Complex. Camposanto means holy land. This is a cemetery that has restored frescoes, funerary monuments, and ancient Roman sarcophagi along seemingly endless marble corridors. The site is a peaceful and contemplative place that few tourists frequent if you need a mid-day retreat from the crowds. That’s the Pisa complex in a nutshell. 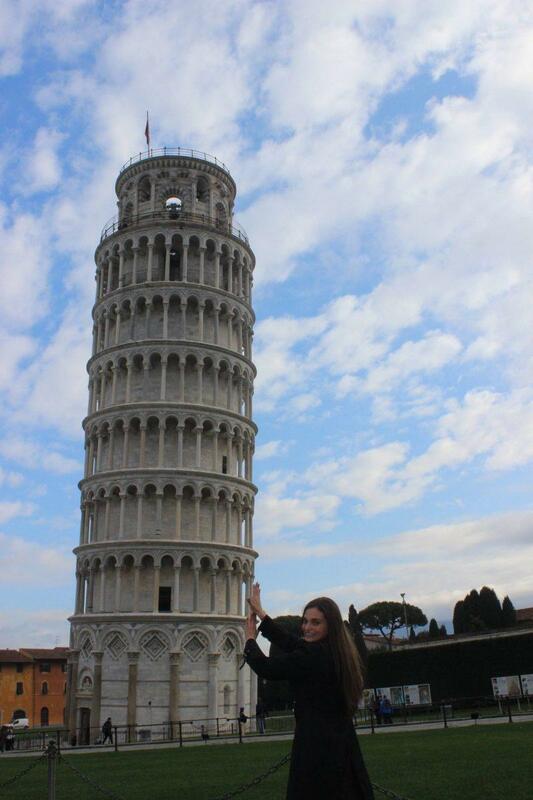 Obviously, the Leaning Tower is the main draw. You can spend time perusing the goal vendor stalls immediately outside the complex. They sell a souvenirs at competitive prices and that’s also where you’ll catch a taxi back to the bus station. If you go early, like before 10am, there’s a good chance you’ll be able to get a picture holding up the tower with little to no people in your shot. Food-wise, there’s not much in the area so if you’re making this a quick trip you’re better off waiting to get back to Florence and then stopping for lunch within walking distance of the train station upon arrival. This is definitely a half-day trip worth making if you’re in Florence. If you catch a 7am or 8am train from Florence to Pisa, you should be back by noon and ready to continue with sightseeing in Florence. 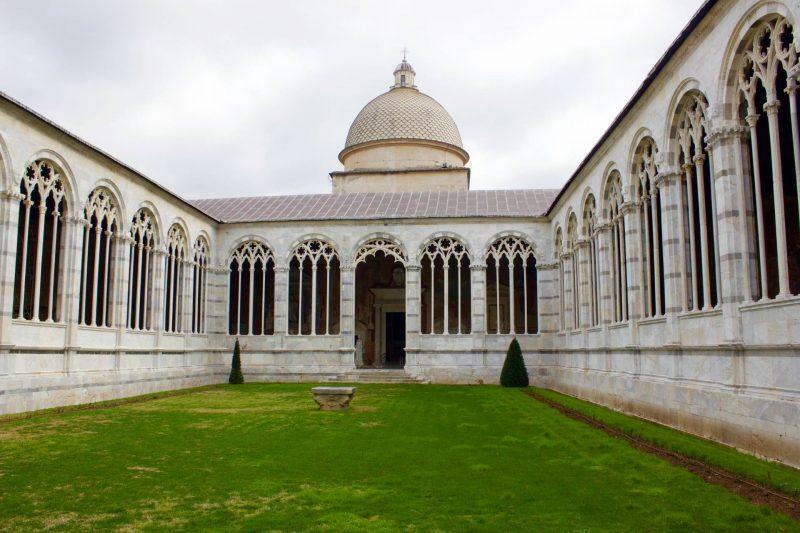 Looking for more day trips from Florence? 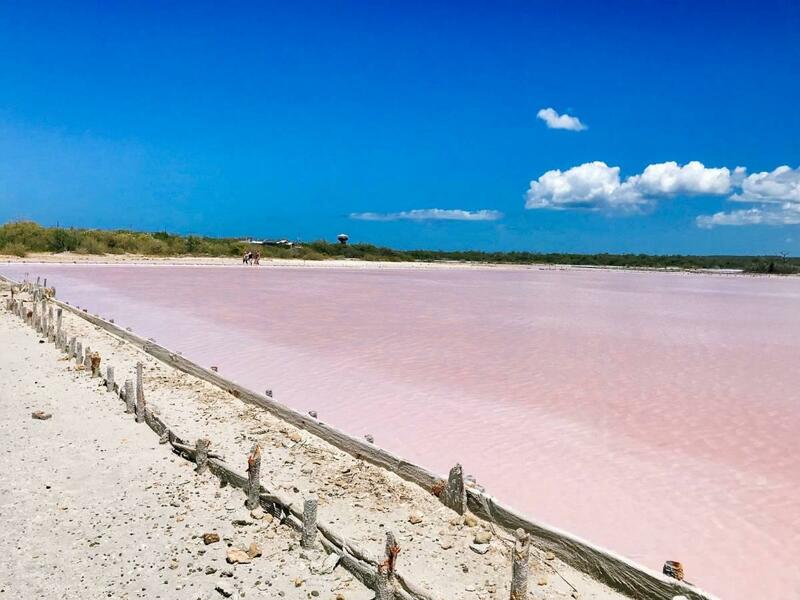 Check out these Tuscany road trips or wander down Via Francigena Toscana. I have always dreamt of going here!! It seems you had a fabulous time there. I need to a holiday ?? So many Pisa things! I actually didn’t realize there was anything to see here besides the leaning tower. Good info! A day trip to Pisa sounds like the best plan! I often hear people say it’s not worth spending several days in the area, but I had no idea it was this accessible from Florence. I honestly had no idea you can enter the tower! I did not know it was on a complex. Good to know. Great pics. love your pics! plus I didn´t know there was another thing to do, after you visit the tower! I never realized how close Pisa was to Florence! 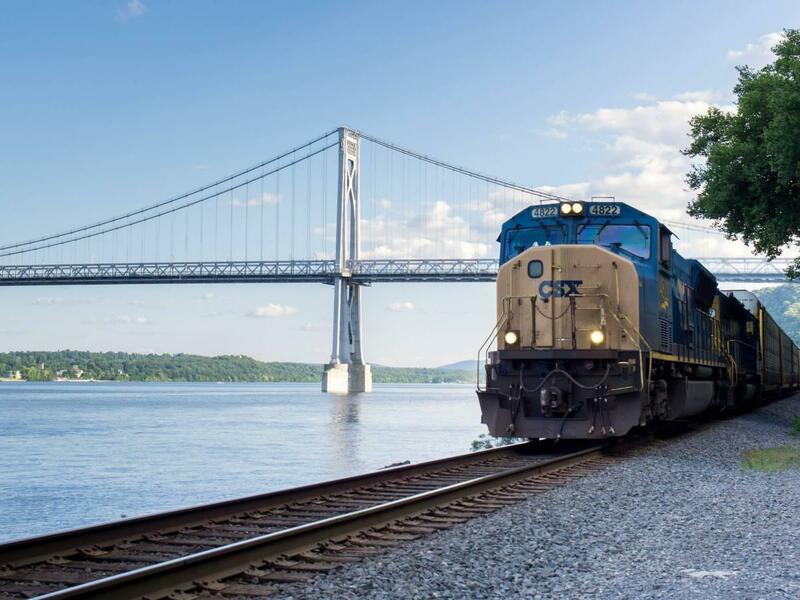 I love the tip on which am train to take to get photos with little to no people in the background. This is perfect! 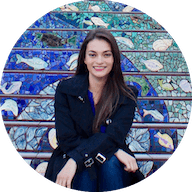 I keep trying to plan my perfect Italy itinerary for within the next few years, and while I’d love to see Pisa, I definitely envisioned myself staying in Florence or Siena. Bookmarking this for later! Didn’t know about the marble steps inside Pisa! That’s amazing. The Italians are known for their architecture so I’m sure it was amazing to see in person. As I read your post, I’m so bummed! I was in Florence a couple of years ago and really wanted to visit Pisa. I didn’t have much time and didn’t think I could pull it off in one day. Looks like i could have. Wish I had your post at the time 🙂 Great pics by the way! Thanks for the article, making it in half of day? definitely going to do it this summer. I have to take the train to Venice right after Pisa trip, do you know how safe It is to leave your luggage in the train station? I understand they have a storage area. Thank you! Absolutely! Sometimes we’re crunched on time but can still get a lot done 🙂 You should have no problem with the luggage storage, I know it’s secured and staffed so someone will be there to look after your things. Have a great time! Thanks for the tips. Flying to Florence in July and will definitely take your advice on the half-day trip to Pisa plan. Hi Jen, doing a cruise in July 2019 and only one day to spend in Florence and was thinking can’t make to Pisa and back. But thanks to your tips, am sure going to make it to Pisa. Great pics as well, thank you so much.